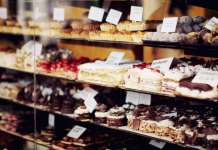 Whenever I travel to a new city I’m always on the hunt for local food favorites and new restaurants/ cafes to try. 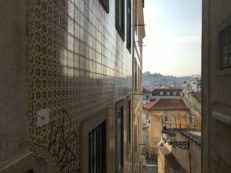 So on our 4 days trip around Lisbon, my sister and I decided to sign up for a food tour with Taste of Lisboa. 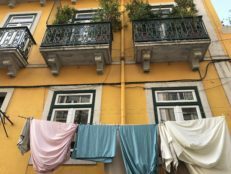 What I loved about this tour is that it was focused on both local food and Portuguese culture. 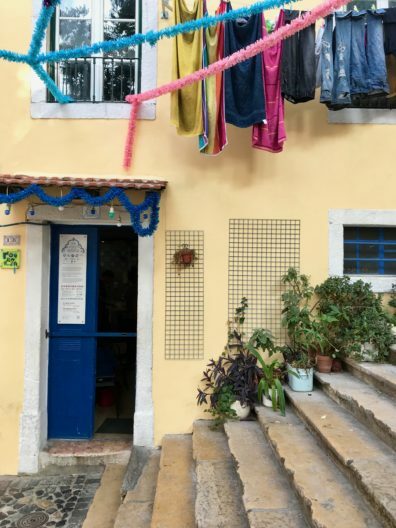 We learned about Portuguese cuisine, as well as the stories behind the food and neighborhoods. 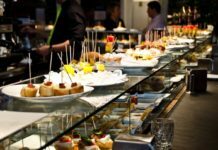 The concept was to take us to more local eateries and taste the local specialties in places that we probably wouldn’t have found on our own. 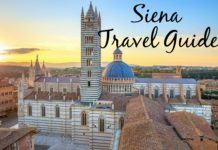 The downtown Mouraria tour was 4 hours in length with 7 food stops and a number of cultural stops around the neighborhoods we visited. 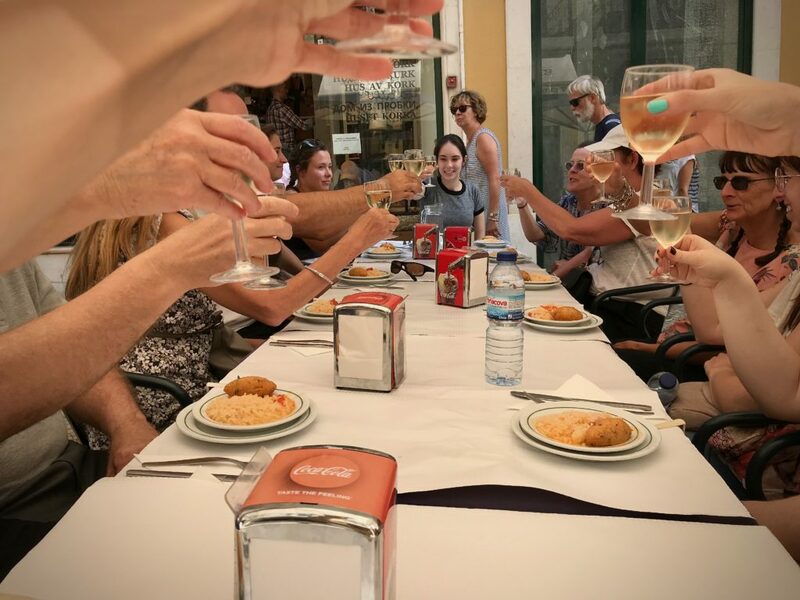 At 3 pm we met our guide Catarina right by Rossio Square to start the tour. 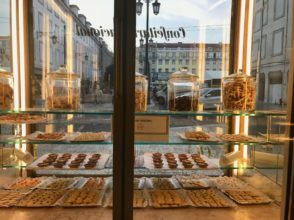 Read on our off the beaten path food and cultural walk with Taste of Lisboa. 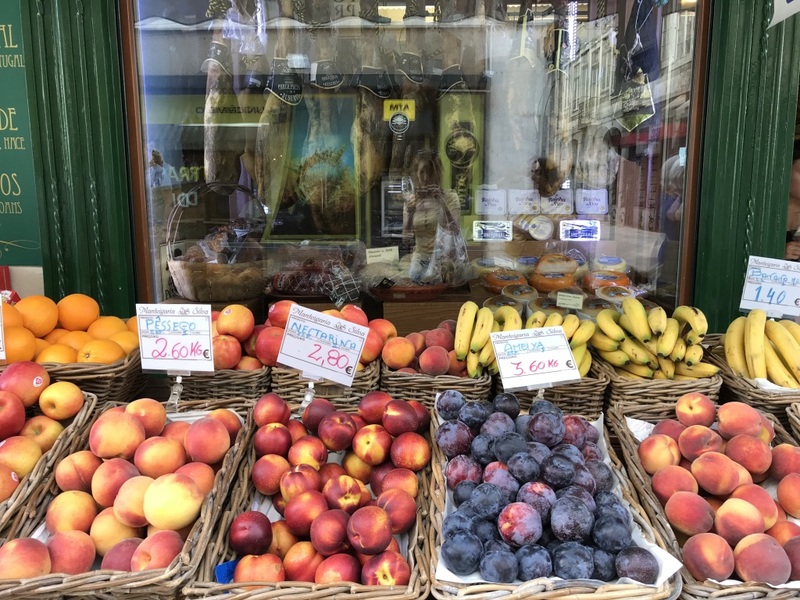 This charming old grocery store sells many local delicacies; From fresh fruits to different cheeses, meats, wines and of course bacalhau (codfish). 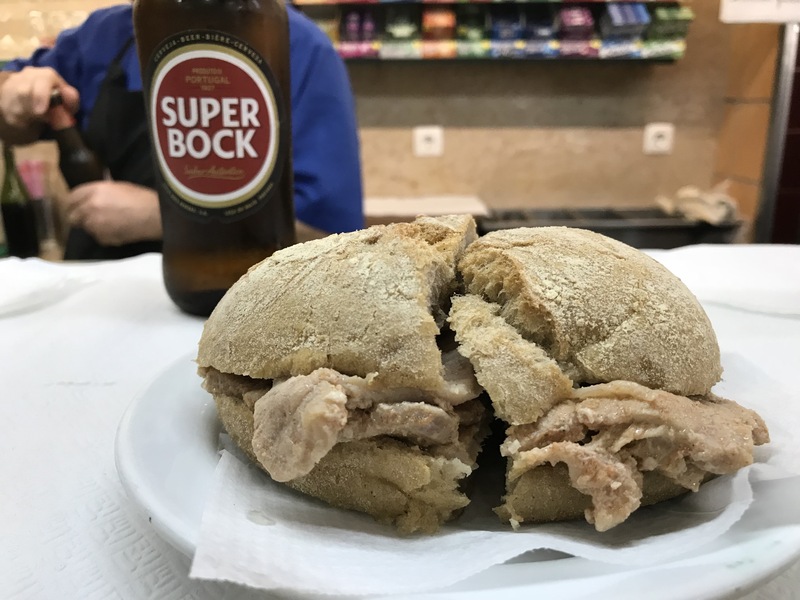 They sell a wide range of salted cod as well as other parts of the cod, the most popular base commodity in Portuguese cuisine. 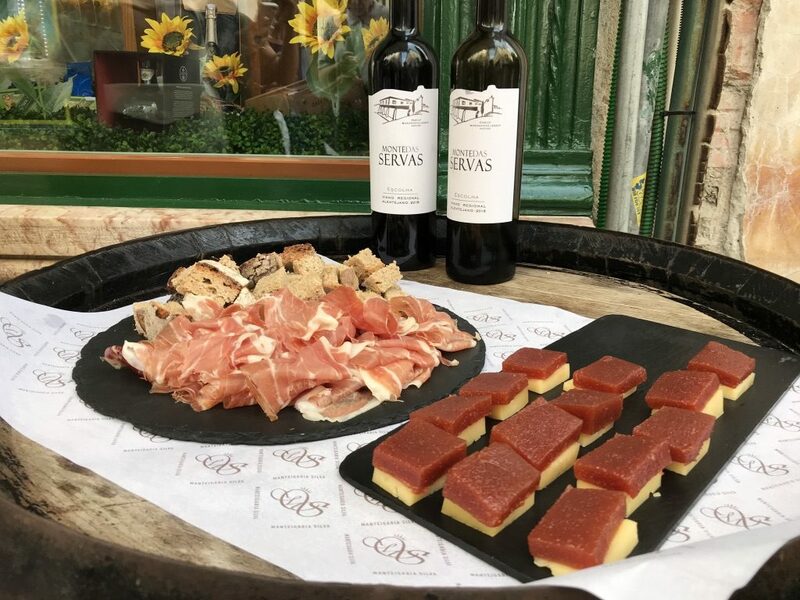 We sampled some local red wine, smooth olive oil with traditional rye and cornbread, some delicious pieces of Pata Negra cured ham, and my favorite “Romeo and Juliet” a Portuguese cheese combined with sweet quince Marmelada. 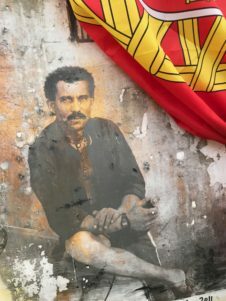 The Portuguese adore codfish and it’s said that they know at least 365 different ways to cook it. 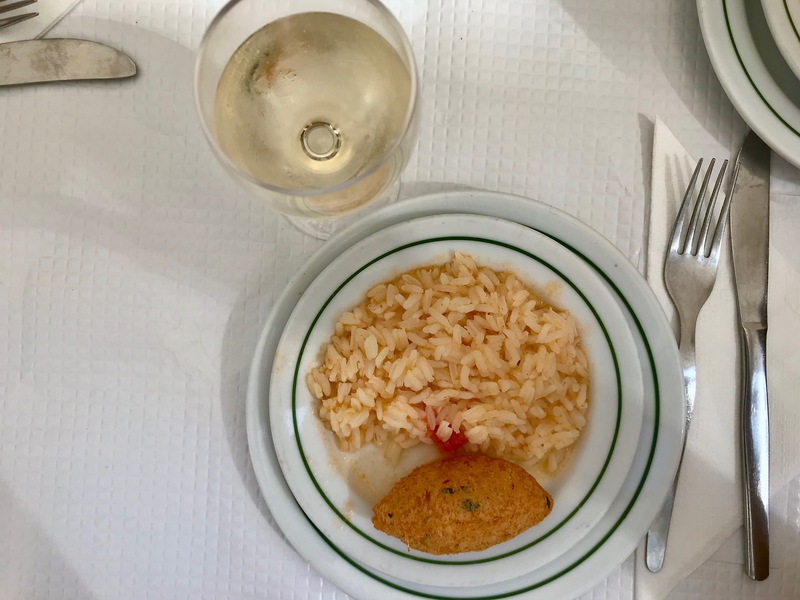 One of the multiple ways to prepare it is in the form of Bolinhos de Bacalhau (codfish cakes) which is also my absolute favorite! 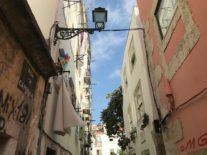 These classic Portuguese snacks are deeply fried to get a crispy outer layer and soft texture on the inside. 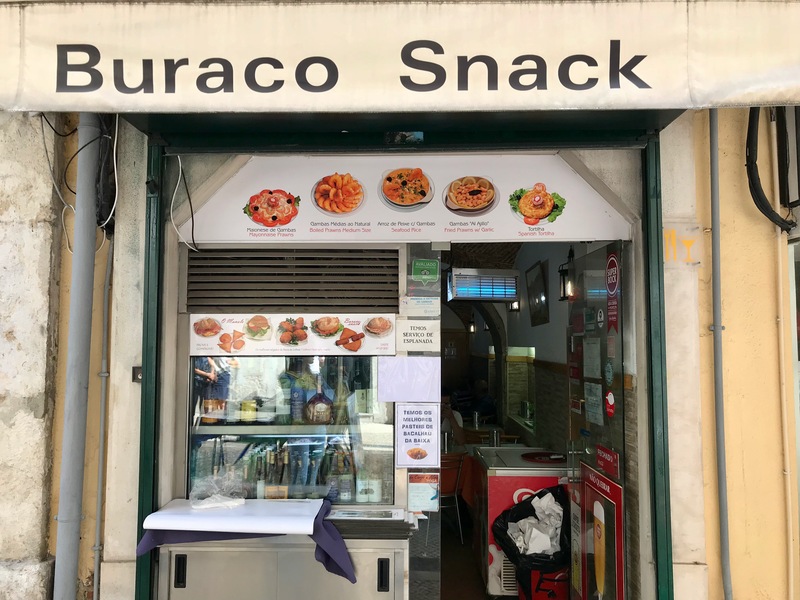 The one we tried in O Buraco Snack, a small local snack bar, was so delicious (and one of the best I’ve had on this trip), paired with creamy tomato rice (Yum!) 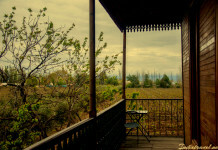 and fresh Vinho Verde (green wine), which is also a must-try in Portugal. 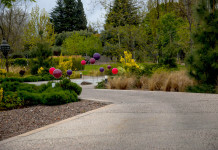 Green wine or young wine is a sparkling summer wine that can be either red, white or rose. 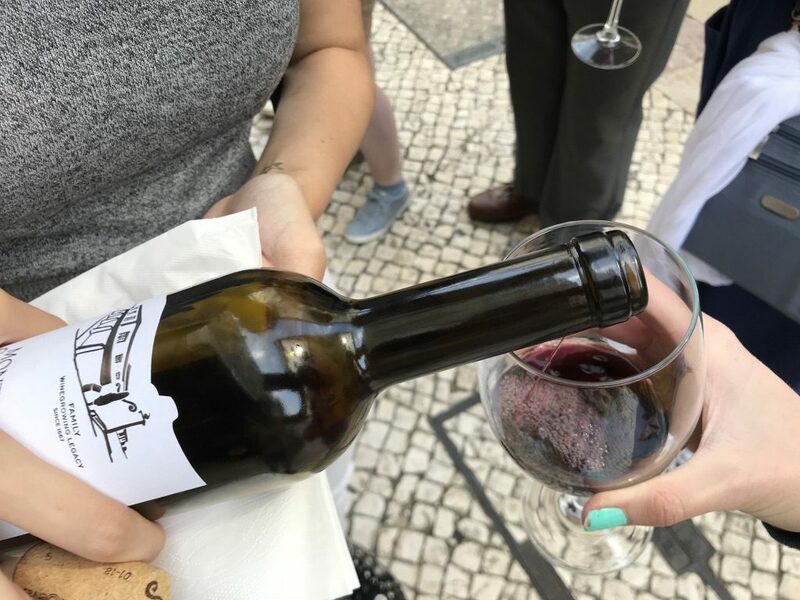 It produced in the North of Portugal and is typically consumed soon after it is bottled. This traditional dish paired with green wine was simply delicious! 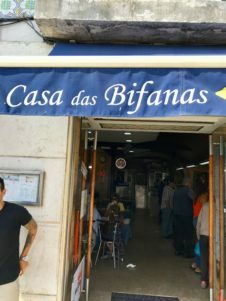 Casa Das Bifanas is a local’s spot for quick, delicious snack-foods, packed with locals and conveniently located at the famous Praça da Figueira. 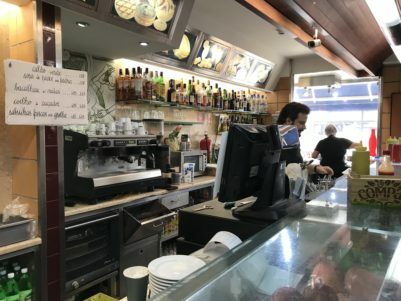 Bifana is a delicious pork sandwich with mustard sauce. 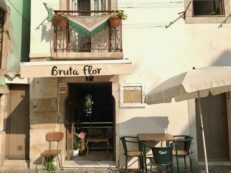 We enjoyed our traditional Bifana standing at the bar paired with a glass of traditional Portuguese beer to go with it. If you like it a little spicy, don’t forget to add some Piri Piri sauce on your Bifana. 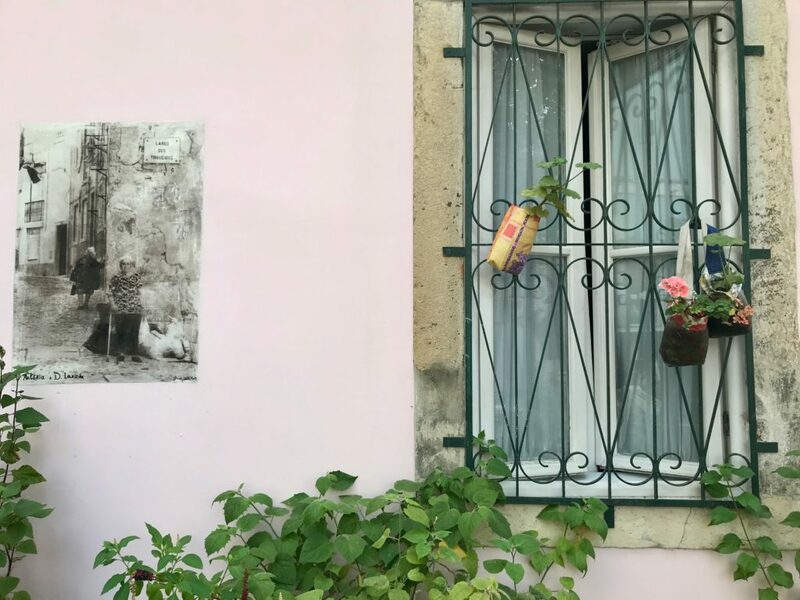 Catarina took us through a narrow alley with beautifully painted portraits of fado singers decorating the facades, until we reached our next stop – Tasca os Amigos da Serva, a tiny and very low key Ginjinha tavern located in this alley in the Mouraria neighborhood. 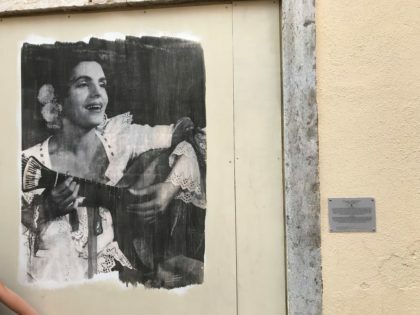 This neighborhood is considered the birthplace of Fado, and the area where Maria Severa, the first fado singer of Lisbon, lived during the 19th century. 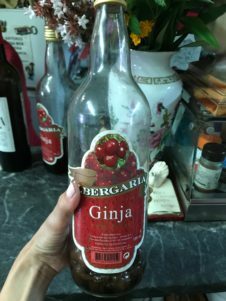 We had a shot of Ginjinha, a sweet Portuguese liqueur originated in Lisbon and made of sour cherry-like berry called Ginja. 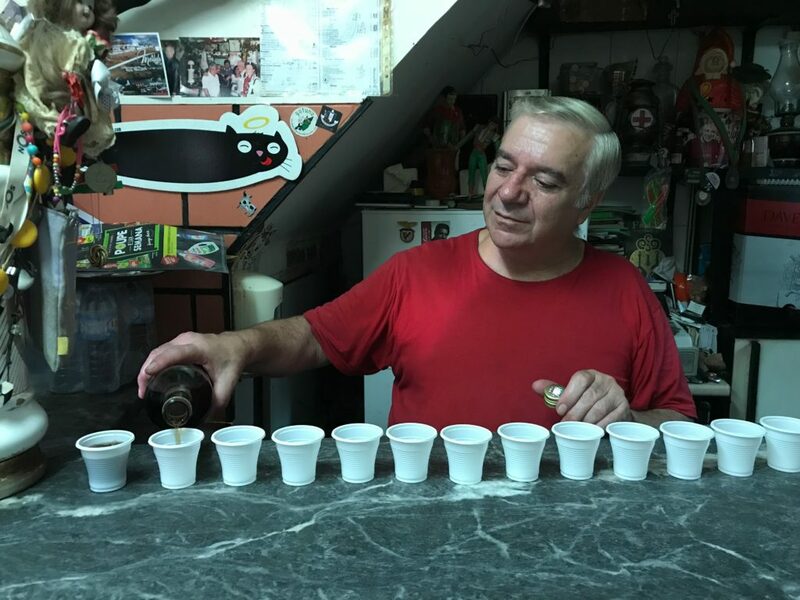 Sr. António Pais, the friendly owners has been working there for over 40 years and the atmosphere of fado is felt everywhere in this charming little bar; with Fado music in the background and old posters and photographs covering the walls. This was my favorite stop and definitely the most magical one. 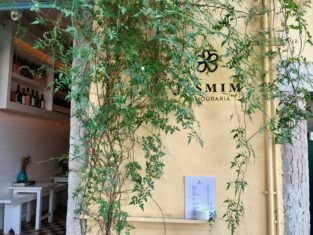 Walking down the beautiful streets of Mouraria, we passed through narrow lanes with charming buildings, decorated with Portuguese tiles and colorful patios and balconies, until we arrived into Jasmim da Mouraria, a wine bar that serves traditional tapas and homemade Portuguese specialties. 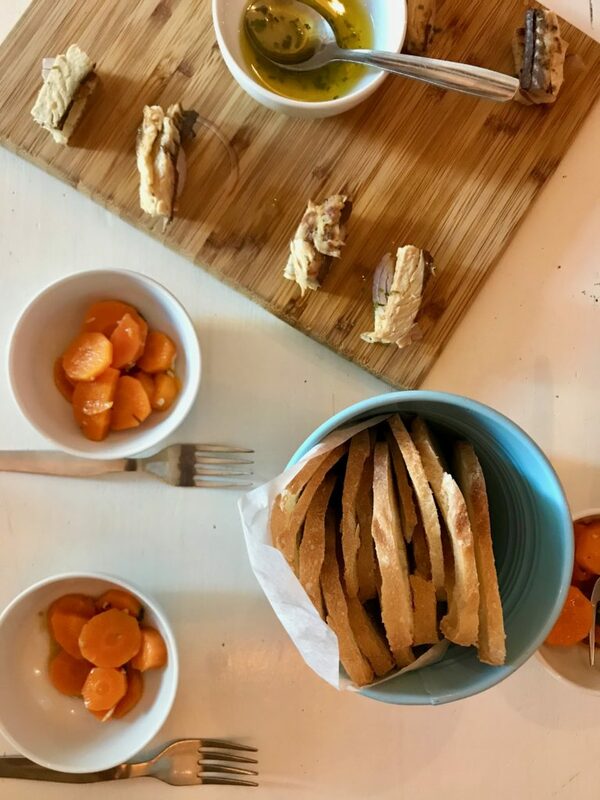 We enjoyed some delicious sardine toasts accompanied with Vinaigrette carrots. 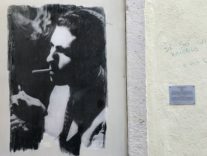 This gem is simply amazing! 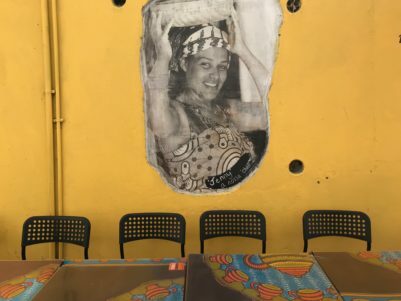 Cantinho do Aziz is a local eatery serving African dishes. 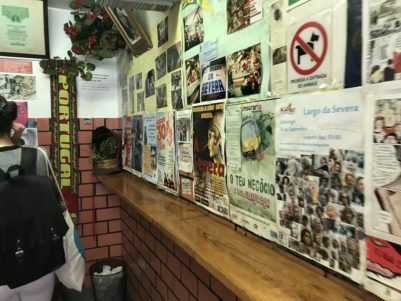 The restaurant was founded in the ’80s and the owners are from Mozambique which was a former colony of Portugal. 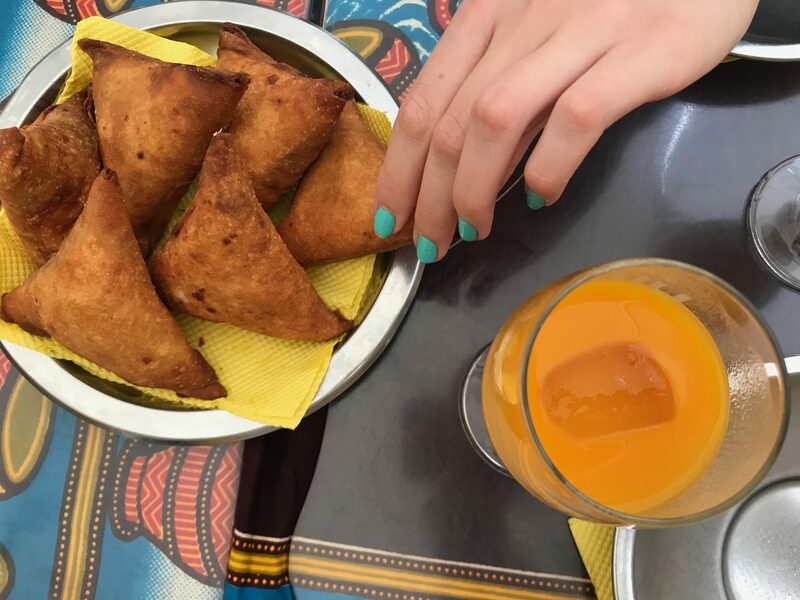 We had the most delicious crispy beef samosas and a glass of mango juice. My sis had their pistachio juice which was also delicious and very interesting. 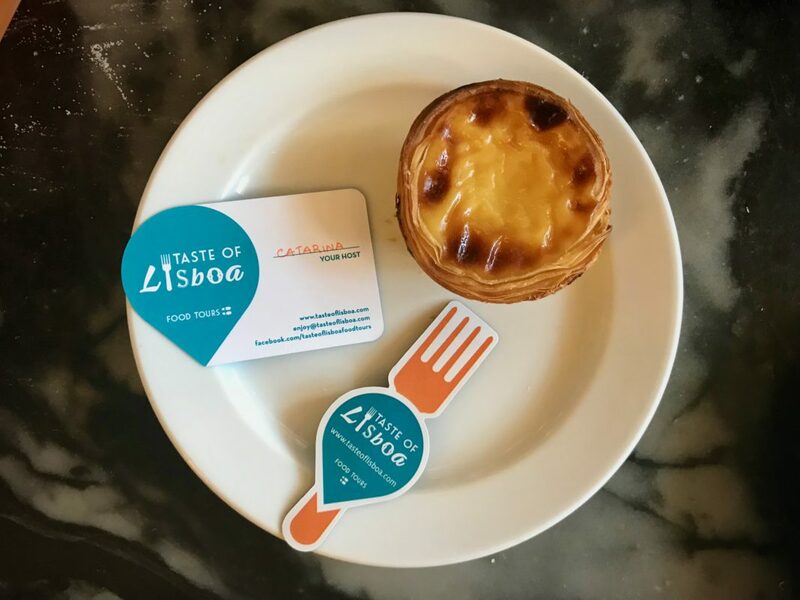 A trip to Lisbon is not complete without having pastel de nata, the famous Portuguese pastry. 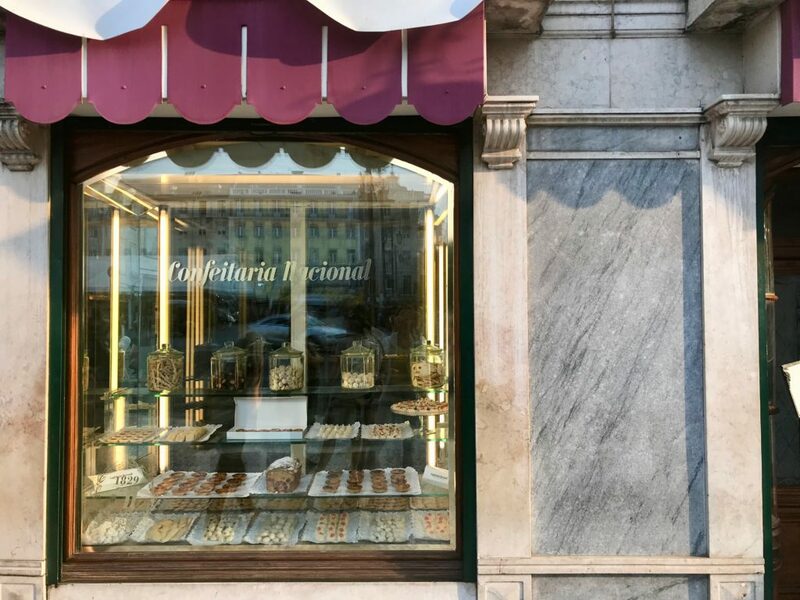 Confeitaria Nacional is an old classic Portuguese pastry shop, located right by Rossio Square. 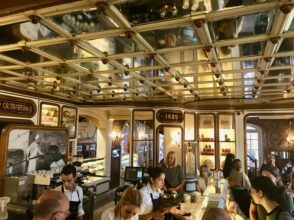 This place is full of charm and the interior is absolutely stunning! 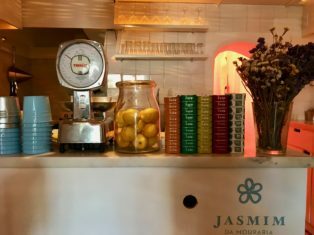 Their pastel de nata paired with an espresso was really good! I must admit I loved more the pastels I’ve tried at the famous “Manteigaria” and “Belem” bakeries, but I think these ones are really hard to compete with and the pastel de nata we had at Nacional was also really delicious and crisp. 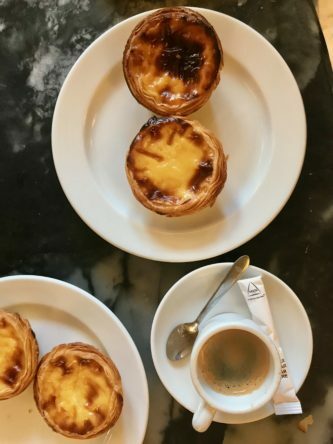 Having this pasteis with Portugal’s signature tiny coffee (bica) was a beautiful end to our tour. 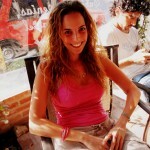 Catarina was so much fun and such an amazing guide and we had such a great time! 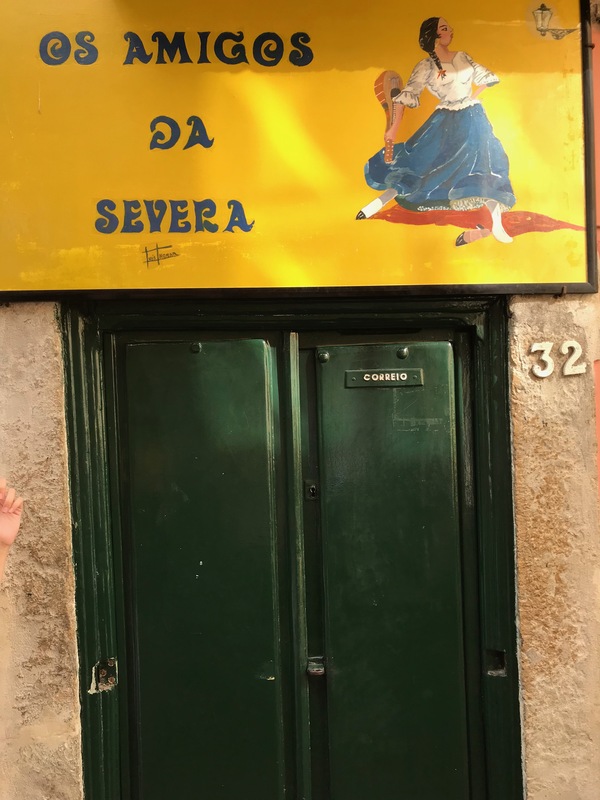 This was one of the highlights of our trip to Lisbon and I recommend anyone who comes to Lisbon to go on a tour with Taste of Lisboa.